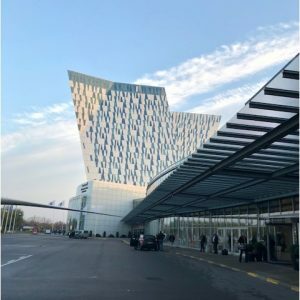 GEXval Inc. participated in BIO-EUROPE 2018, a partnering conference held at Bella Center Copenhagen in Denmark from November 5 to 7, 2018. GEXVal’s participation in BIO-EUROPE 2018 was supported by the Japan Bioindustry Association (JBA) as part of the 2018 Project for Support of Local Core Businesses (Project to Create and Support Biotech Company Networking in Kanto) promoted by the Kanto Bureau of Economy, Trade and Industry (METI-Kanto). GEXVal enjoyed valuable opportunities to network with a number of companies and investors in an efficient manner by using the partnering system offered by the conference. GEXVal also exhibited posters in a booth (Booth No. 45) co-sponsored by the METI-Kanto and the EU-Japan Centre for Industrial Cooperation (EU Center), which was also a part of the METI-Kanto project. In the evening of November 6, a networking event was held in the EU Center booth (Booth No. 44), which offered a casual socializing opportunity for venture entrepreneurs as well as those engaged in life science business from around the world to interact with each other while enjoying Japanese sake.